As indicated by the dotted red lines on the map: Half-hour and 1-hour parking is available along Monument Square. Longer-term parking is available in the lot directly behind Holy Family Church on Bedford Street. Take Route 2 West from Boston until you reach the bottom of the hill at Crosby’s Mobil. Route 2 will veer off to the left and you will continue straight on Cambridge Turnpike following the signs to Concord Center. After just over a mile, you will merge with Lexington Road (Route 2A) which will take you to the traffic circle in Concord Center. Continue straight to park along Monument Square or right onto Bedford Street to park in the lot behind Holy Family Church. Walk up the ramp to the main entrance of 30 Monument Square. In the foyer you can either take the elevator or the stairs down one floor. Suite 200B will be on your right at the bottom of the stairs. Take Route 128 to Exit 29 for Route 2 West. Then follow the directions outlined above. Take Route 2 East to Route 62 East towards Concord Center. 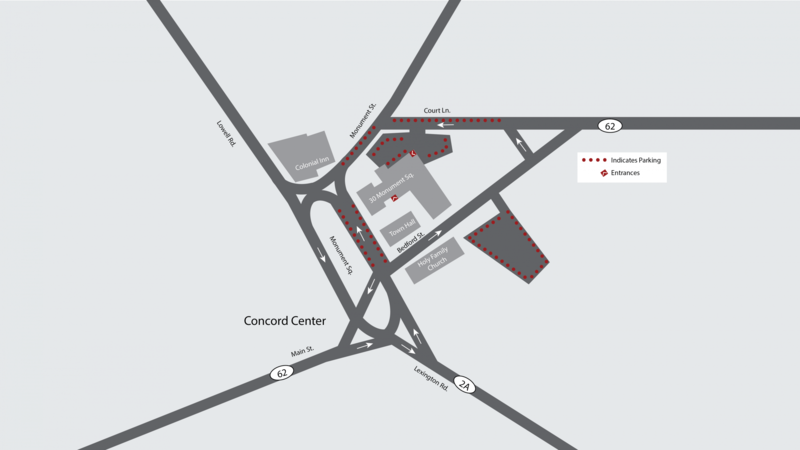 Follow Route 62 which becomes Main Street to the traffic circle in Concord Center. Turn left to park along Monument Square or left and then a right onto Bedford Street to park in the lot behind Holy Family Church.